Come mealtime, take a break from the usual downtown culinary establishments and experience something truly sophisticated and intimate. Calago a large Victorian home sporting numerous dining rooms sits at the south end of Marsh Street. 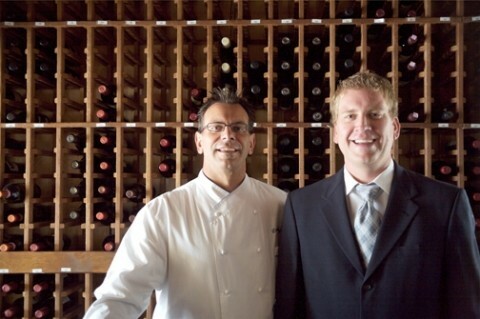 FOOD AND WINE PAIR : Calago co-owners David Wohrle (left) and Ron Hahn (right) are cooking up a new look and taste for their downtown eatery. # Co-owners David and Anissa Wohrle have worked hard to set themselves apart from the youth-driven nightlife of downtown San Luis Obispo, so what are they doing transforming a quaint dining room into a trendy lounge, complete with a full bar, to open in early November? As of Oct. 2, the Wohrles are no longer flying solo. Wine aficionado Ron Hahn has joined them as co-owner of the fledgling establishment, and a new look is in the works. "Our top priority is to remodel and create a cocktail lounge," Hahn said. "I want to continue what David and Anissa have done with the customers. They feel at home when they come here." The unusually intimate service, coupled with incredible cuisine, makes Calago a favorite of anyone lucky enough to discover the restaurant hidden behind a barley noticeable sign in a building that hardly resembles a dining establishment from the outside. "I have eaten here almost every day this week," said Jenny Childers, a neighborhood resident who happened upon the restaurant a few weeks ago. "They have wonderful pastas. It's a very welcoming old Victorian with all its nooks and crannies a great date place." Chef David originally trained at the Washburne Culinary School in Chicago, and then honed his skills under the tutelage of Chef Alfred Portale at the Gotham Bay Grill in New York. "Portale changed my whole life," Wohrle said. "He opened my mind to food and the things you can create." Every once in a while, you discover a meal so tasty you lose your bearings, stop talking, and savor the moment. Such is the union of homemade pastas, tantalizing herbs, and fresh seafood found in David's shitake and porcini mushroom ravioli served with fresh grilled salmon topped with roasted garlic parsley pesto. Chef David has crafted a menu of Northern Italian delicacies and Caribbean fruits and spices. The result is a mix of unusually savory dishes such as his shrimp and mango risotto infused with fresh artichokes, sun-dried tomatoes, and asparagus. The restaurant features an extensive list of local and foreign wines, as well as superbly crafted dishes. The lobster bisque and the papardelle created with sweet Italian sausage, rapini, garlic, fresh basil, and tomato are customer favorites. Few guests will complain about the prices, which range from $8 for the fresh half-moon pasta appetizer filled with chicken, mascarpone, prosciutto, cream, and fresh herbs, to $34 for the New York steak painted with porcini and shitake mushrooms, fresh herbs, and white truffle oil. Calago stands just north of the Hwy. 101 exit, at 450 Marsh Street. It's open for lunch from 11:30 a.m. to 2 p.m., Tuesday through Friday, and for dinner from 5 p.m. to 9 p.m., Tuesday through Thursday, and from 5 p.m. to 10 p.m., Friday and Saturday. For more information, call 541-5393. Staff Writer Karen Velie compiled this week's Strokes and Plugs. Send your business news to kvelie@newtimesslo.com.